Economic disruption has seen some workers losing their jobs or having to move into new industries. 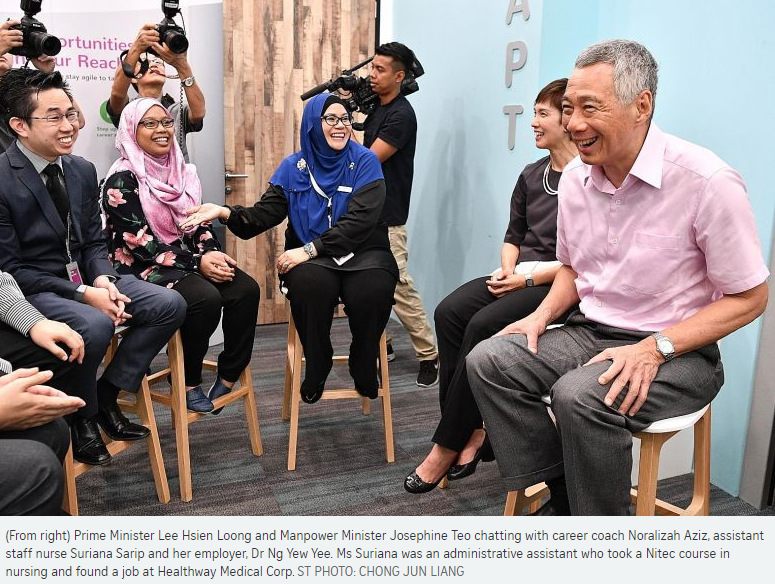 For about 2½ hours yesterday, Prime Minister Lee Hsien Loong spoke to some of the affected workers to get a sense of the challenges they faced in training to take on new jobs. He also spoke to career coaches who encouraged them along, and to employers who helped them in their journey to switch careers. His assessment: He was glad to see a lot of good work being done on this front. "I am very happy to see the enthusiasm here, and that they are seeing some results," he said, speaking to reporters at the Lifelong Learning Institute in Paya Lebar. He highlighted the growing number of people placed in jobs through Adapt and Grow programmes. There were about 30,000 placements last year, a rise from 25,000 the year before. The initiative run by statutory board Workforce Singapore (WSG) offers Singaporeans programmes to learn new skills, guide them in their job searches, adapt to new jobs and grow in their careers as the economy undergoes restructuring. Although many people are anxious about the changes brought about by economic transformation, help is available, said PM Lee. "In Singapore, we have spent a lot of effort to put in place quite comprehensive procedures, and already have some experience. So, Singaporeans should have confidence." The changes Singapore faces are unavoidable, but the way forward is to become more productive, do better jobs and earn better pay, he said after his first visit to WSG's Careers Connect centre in Paya Lebar, where jobseekers can meet career coaches and access career resources. PM Lee also said the economy is doing well and productivity has been high, which shows the economy is not just expanding, but is upgrading and improving. Singapore's economy grew 3.3 per cent last year and 3.6 per cent the year before. Growth in productivity, measured as real value-added per actual hour worked, came in at 4.5 per cent in 2017. But the gains are uneven, with the export-oriented sectors upgrading rapidly to stay competitive, while domestic services are slower, PM Lee said. When asked how Singapore is doing on its restructuring journey, he said a lot of progress has been made. "In eight years, our economy has grown, our productivity has gone up, our workers' wages have gone up, we have kept our unemployment down, and our employment rates have gone up, for the old people particularly, for the women also." But the journey is not over, he said. "I don't think we will ever be done. Ten years from now, I am sure we will still be talking about productivity growth and upgrading, but 10 years from now, if we do our work right, we will be in a stronger position than we are today." It's a constant refrain among businesses: there aren't enough workers. Insight looks at why there is a labour crunch, what affected sectors are doing, and what more could be done. Companies in Singapore are finding it tough to fill vacancies, whether for highly-skilled roles in the tech sector or labour intensive jobs that fewer locals are keen to do. Behind this manpower crunch - which some say is holding back business growth plans - are a greying population and tight foreign labour policies, as well as a mismatch between jobs in demand and the skills needed to fill them. As of 2018, population growth fell to 1 per cent over the last five years from 3 per cent the previous five. With the resident birth rate slipping over the past two decades or so, fewer Singaporeans are entering the workforce. The number aged 20 to 64 is expected to peak at 2.2 million around 2020, and will decline after that. Adding to population trends are policy issues, such as a tightening of foreign worker inflows that traces back to 2010, DBS economist Irvin Seah tells Insight. "Many companies were not given enough time to adjust," says Mr Seah, who notes the tightening aimed to encourage businesses to invest in technology and reduce reliance on cheap foreign labour. This started with higher levies for work permits and S-Passes. Further measures include a move last year to open vacancies to locals first. But not every industry can be automated yet. Some, like cleaning, remain labour intensive, says Mr Seah. "Policy has tightened aggressively and in segments where manpower is needed the most," he says. "These are jobs that Singaporeans shun, to begin with." While corporations have more resources to invest in technology and tend to engage in higher value work, he says, smaller enterprises bear the brunt of such policy moves. The labour market report released by the Manpower Ministry last month also noted there were more vacancies than job seekers for a third consecutive quarter. Labour economist Randolph Tan, an associate professor at the Singapore University of Social Sciences, expects the shortage to worsen in specialised areas like data science. Even as schools now have courses like business analytics, it will take time to develop enough specialists to meet demand - and companies need them already. "Demand for talent is not just getting higher, it seems to be spiking. A lot of what we are using is producing a lot of data and some organisations are able to use it to their advantage. Those that don't, do so at their own peril," he says. As tertiary institutions ramp up enrolment for in-demand fields, a cross-sector study involving NTUC is also looking into how workers can be matched to future jobs - to pave the way for specific training programmes for each sector. Their efforts to combat Singapore's labour shortage complement companies' moves towards automation for repetitive tasks, a national push for lifelong learning, and programmes to help professionals "convert" their skills for new roles. While the demographic shift towards an ageing population plays out more gradually, giving policymakers leeway for changes, DBS Bank economist Irvin Seah says the jobs-skills mismatch appears to be a more "burning" issue. There are few policy options available, beyond helping displaced professionals, managers, executives and technicians (PMETs) upskill, he says, and this group tends to spend more time finding a new job. Targeted schemes such as Workforce Singapore's Professional Conversion Programmes help alleviate this, as they allow PMETs to either be hired before being trained for a role, or to be given training ahead of job placements. Such efforts extend beyond government support. Last year, local universities increased their computing intakes by as much as 25 per cent, with some starting new courses as well. Such moves can increase the talent pool in the pipeline, although such is the demand that students already receive job offers before graduation. For employees already in the market, the study is looking to collect data from different clusters to help define how workers can be trained even as workplaces undergo changes. This move towards "Worker 4.0" includes paving the way for specific training programmes in various sectors. Mr Kurt Wee, president of the Association of Small and Medium Enterprises, says that while smaller firms are hit by the labour crunch, many have already "transformed" by digitalising processes in human resources and accounting. Labour-intensive sectors such as food and beverage, and manufacturing have also been freeing up workers for higher value tasks. "The transformation push is going to remain critical, and businesses have to find ways to work at optimal productivity so they can overcome the manpower crunch," says Mr Wee. One step towards easing the labour crunch could be allowing smaller enterprises to receive "preferential treatment" in more areas, to hasten their adoption of technology and innovation, say economists. To respond to shortages, companies can also tap older workers who are past retirement age, and people who have been out of the workforce for a long time, such as caregivers. While workers should be prepared to retrain for new roles, more could be done to help identify the best courses for reskilling, beyond identifying the broad skills they can learn, says Associate Professor Randolph Tan of the Singapore University of Social Sciences. "The degree of training is haphazard, and this is causing companies a lot of angst," he adds, noting that there are no tailor-made approaches to reskilling workers. Businesses need to step up as well, with Mr Kurt Wee, president of the Association of Small and Medium Enterprises, adding that "companies need to train their manpower and ready them for how jobs are going to evolve". "Businesses should also use this period of transformation to work towards an optimal business model that is digitalised as well," he said. But as smaller enterprises may find it harder to invest in technology that can automate some of their tasks, DBS economist Irvin Seah says "preferential treatment" for such companies could be expanded. An example is the Automation Support Package announced in Budget 2016 to help companies adopt technology, drive productivity and scale up, with over $400 million set aside for three years, he says. Under the scheme, small and medium-sized enterprises (SMEs) have better access to loans for qualifying projects, and the Government's risk-share with participating financial institutions is 70 per cent - up from 50 per cent - for projects. But Mr Seah notes: "Some SMEs may find it onerous to meet documentation requirements for certain grants. Instead, bigger companies, which are of better financial standing, end up qualifying and receiving aid. There should be more equitable access to these resources." Share of workers aged 55 and up in the resident labour force in 2018 (preliminary figures). Share of workers aged 55 and up in the resident labour force in 2008. Full-time employment rate for older residents aged 55 to 64 in 2017. Part-time employment rate for older residents aged 55 to 64 in 2017. In which there were more vacancies than jobseekers, according to a Manpower Ministry labour market report. Projected number of years of "full health" for Singapore residents in 2030. The year when the number of people aged 20-64 is expected to peak at 2.2 million. Life expectancy at birth for Singapore residents in 2017. When Ms Premalattha Sadhasivan, 60, was asked to take a large pay cut in 2017 as her company was downsizing, she was anxious to find a new job. Then a manager at a private education institution, she was paying off her elder daughter's education loans for postgraduate medical school overseas. Her husband was semi-retired. But, she says, it is easy to lose confidence while looking for a job at her age. "Employers who look at resumes of mature workers may think 'slow, cannot work'." She soon became a social worker at Sree Narayana Mission (Singapore), and was made head of the rehabilitation department, thanks to her past managerial experience. She hopes to continue working after she reaches retirement age next year, by doing her part to stay valuable to her employer. "I can feel that my younger co-workers are very fast with computer skills and are more nimble, so I have to spend a bit more time to learn and keep myself healthy," she says. Ms Premalattha is among the one in three Singapore resident employees today aged 50 and above. With an ageing workforce, Singapore's manpower challenges are only set to rise as the working-age citizen population - those aged 20 to 64 - is projected to peak next year. Tapping the growing pool of older workers is one way to ensure companies and organisations can continue to flourish. "At a national level, keeping older persons in productive employment can arrest or even reverse the deterioration in the old-age support ratio and possible weakening of the country's fiscal position from an increase in the number of old-age dependents," Institute of Policy Studies (IPS) senior research fellow Christopher Gee tells Insight. Being gainfully employed also helps people age successfully, and relieves family members from the responsibility of financial support and care, he adds. But even as the employment rate for older workers has improved, many worry about maintaining their income in their later years, while employers worry about medical costs and the ability of older staff to cope with technological changes. This was among feedback gathered by a work group reviewing policies on re-employment and retirement adequacy, which was shared at an IPS forum last week. Members of the Tripartite Workgroup on Older Workers - first announced in May last year and now six months into its review - were quizzed at the forum on the need for a legislated retirement age. Former Nominated MP Kanwaljit Soin had commented at the forum that with so many years of good health expected here, it would be hard for people to work for 35 to 40 years and then sustain another 35 to 40 years of retirement. "To keep the retirement age at 62, and then to give yearly extensions, workers feel very insecure and they cannot plan for their lives," she said. The statutory retirement age is 62, meaning employees below 62 cannot be unfairly dismissed based on age. Companies must also offer eligible workers re-employment up to age 67, though there is flexibility for adjustment in employment terms such as wages and benefits. Senior Parliamentary Secretary for Manpower Low Yen Ling, a member of the work group, said that based on the feedback received by the Tripartite Workgroup on Older Workers, the construct of a retirement age and re-employment age remains relevant. The desire of older people to work as long as they want to with the same wages and benefits must be balanced with the need to ensure they remain employable and companies remain competitive, she said. Companies should not be forced to employ people for too long, added fellow work group member Alexander Melchers, who is vice-president of the Singapore National Employers Federation. "Legislation can guarantee there's a job only if there are jobs." While some workers are keen to take a break or move into less intense roles as they age, others, like Ms Premalattha, want to or need to keep working. The Centre For Seniors, which helps older people manage transitions in life, surveyed over 1,100 people aged 50 and above in 2016, and found that only 10 per cent want to retire. In fact, finding work in lower-skilled, low-pay service jobs is not difficult for older workers, and many are employed in industries like retail, security and cleaning, says NMP Walter Theseira, an economist at the Singapore University of Social Sciences. "The challenge is whether employers are willing to consider older workers for more desirable, high-pay, high-skill jobs," Associate Professor Theseira tells Insight. Employers still harbour concerns that an ageing workforce means that they face the rising cost of providing medical benefits and uncertainty over whether older workers can perform jobs redesigned to suit them, noted Mr Vikas Sharma, research director at Blackbox Research, which organised public engagement sessions for the tripartite work group. An employer had said the challenge is to find what jobs older workers can do, as new jobs in the market may not be suitable for them, shared Mr Sharma at the IPS forum. But some employers also see mature workers as an asset. Ms Premalattha's employer, Mr S. Devendran, chief executive of Sree Narayana Mission (Singapore), says older employees are well positioned to empathise with people facing challenges. "They have their life experience, which is not something that can be taught in a classroom," he says. As more Singaporeans hit retirement age and wish to carry on working, many hope their employers - and would-be employers - share this view. Recognising that having enough for retirement is a concern for Singaporeans, and that many need help coping with the changing nature of jobs, policies have been put in place to boost the employability of older workers. Raising the re-employment age from 65 to 67 in 2017 is the latest legislative change. Re-employment rates are high. More than 98 per cent of local, private-sector workers reaching the age of 62 who wish to continue working are offered re-employment, Mr Lee Pak Sing, divisional director for the workplace policy and strategy division at the Ministry of Manpower (MOM), said in a presentation at last week's forum. Also, the majority of those re-employed in the same job were paid at least the same wages as before. Mr Lee said an MOM study in 2017 found that retirement and re-employment laws have raised the employment rate of the targeted group of older workers an average of 1.6 percentage points a year since being implemented in 2012. Central Provident Fund (CPF) contribution rates have also been raised over the years to help workers save more for retirement. In 2016, both the employer and employee CPF contribution rates for older workers were raised, bringing rates for those aged between 50 and 55 on par with those of younger workers, at 37 per cent. But the rates still drop for workers older than 55, and range from 12.5 per cent to 26 per cent of wages, and there have been calls to raise these. Institute of Policy Studies senior research fellow Christopher Gee noted that while the rationale for the reduction is to keep older workers attractive to employers, it inadvertently brands them as "older", and presumes pay should be lower just because they have passed 55. "It also has little relationship to the worker's actual productivity and value to the employer," he said. To help workers cope with the transforming economy and to encourage bosses to retrain workers, there are also skills training subsidies and job placement help such as the Career Support Programme focusing on mature workers. Other measures to encourage bosses to employ older workers include wage subsidies in the form of the Special Employment Credit, which offsets 3 to 11 per cent of wages for workers aged 55 and over, who earn up to $4,000 a month. Companies can use WorkPro grants to implement job redesign projects, age management practices and flexible work arrangements. New guidelines were rolled out last year under the Tripartite Standard on Age-Friendly Workplace Practices, which firms can voluntarily adopt. They include avoiding using age as a recruitment selection criterion and appointing a member of senior management to champion age-friendly workplace practices. For instance, the re-employment age, now 67, could be linked instead to the health-adjusted life expectancy, which estimates the number of years a person is expected to live in good health, says Institute of Policy Studies (IPS) senior research fellow Christopher Gee. The number was 73.6 in 2016 and is projected to be 76.7 in 2030. "With health advancements, fixed chronological age milestones become less and less relevant indicators of someone's productive capacity," he tells Insight. The employee is not forced to continue working if he does not wish to, nor is the employer forced to offer him the same terms as before, he adds. Companies can also change the way they compensate employees. Pay structures are often still linked to age, with older workers being paid more than younger ones. This typically happens because companies want to encourage workers to stay on with the firm, or encourage younger workers to put in a tremendous amount of effort to reach a small number of high pay senior positions, says Nominated MP Walter Theseira, an economist at the Singapore University of Social Sciences. "What the employer wants is for the worker to put in more effort than they're getting paid, earlier in life. Later in life, the worker is paid too much, so the employer looks for reasons to terminate them," he says. Removing this age-wage structure could improve the employability of older workers. This view is echoed by Dr John Elliott, a recently retired associate professor of psychology at the National University of Singapore, who says that paying workers more when they are younger has two major benefits: "You get more money when you need it, for example to start a family, and less when you're older so it is less of a disincentive for employers to employ you." 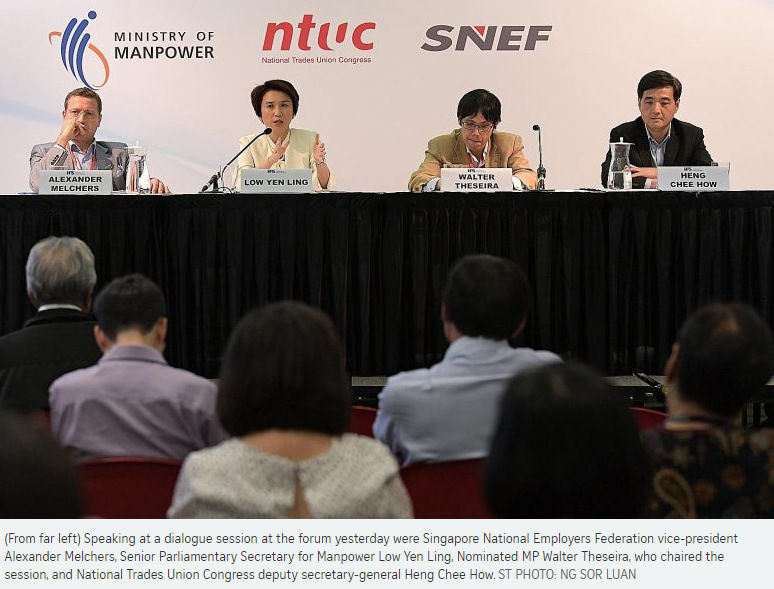 But National Trades Union Congress (NTUC) deputy secretary-general Heng Chee How said at an IPS forum last week that front-loading wages may not be the best solution. "To replace one form of tyranny with another is not necessarily the answer," he said, suggesting instead the use of a more objective performance-based measure to determine pay, regardless of age. Mr Heng, who is a member of the Tripartite Workgroup on Older Workers, noted that the ratio of maximum to minimum salary for individual jobs here has come down over time as more companies use performance-based systems. In fact, if issues with employment such as age discrimination or the age-wage structure are addressed, the need for a retirement age could be eliminated, said Associate Professor Theseira. AGE Even though there is a statutory retirement age, companies can already go beyond this to raise or remove the limit for their staff. A number have done so. Novotel Singapore Clarke Quay and Prudential are examples of employers who scrapped the retirement age, while Gardens by the Bay and ComfortDelGro Group have raised their retirement ages to 65 and 67 respectively. NTUC secretary-general Ng Chee Meng has called on more employers to voluntarily raise the retirement age for their staff. Some 20 unionised companies have either voluntarily raised their retirement ages or do not stipulate any retirement age in workers' employment contracts. Control over how long to work and the intensity of the work emerged as some of the aspirations of Singaporean workers during the tripartite work group's public engagement sessions. To encourage workers to extend their working years, companies can also offer flexible work arrangements such as job sharing, where a full-time job is broken into two part-time jobs, work-from-home days or flexible hours. Mr Lee Pak Sing, divisional director for the workplace policy and strategy division at the Ministry of Manpower (MOM), said in a presentation at the IPS forum that there is scope to raise the part-time employment rate for older workers, which stood at 8.3 per cent in 2017 for Singapore residents aged 55 to 64. This places Singapore in 23rd position against Organisation for Economic Cooperation and Development countries, compared with its 9th position for the full-time employment rate for older workers. But some seniors may be working because they need the income, so part-time jobs may not be sufficient for them, notes Ms Lim Sia Hoe, executive director of the Centre for Seniors (CFS). Some older workers hope for more support to go for training as job demands evolve, although some employers also find their staff are fearful of change. MOM data shows that the training participation rate among Singapore residents aged 50 to 64 rose from 28.8 per cent in 2016 to 33.7 per cent in 2017, but still remains lower than the overall rate of 47.9 per cent. Finally, one common theme is the need to shift mindsets among employers to recognise the value of older workers in their organisations. Institute for Human Resource Professionals chief executive Mayank Parekh says that many studies in the United States have shown that multigenerational workforces are more productive and have less turnover than those without age diversity. "Stereotypes and the toxic narratives - from 'resistant to change' to 'too old to learn' - should be debunked," he says. As for those seniors who do wish to retire, good planning in terms of finances and a routine is important, said CFS' Ms Lim. "Be aware of and understand life transitions so that you are confident to handle changes, take care of yourself and your health, and remain purposefully active in the community," she says.